Clifton, NJ  At the national conventions of two U.S.-based Lemko organizations this month, elections resulted in the selection of new Presidents, signaling the organizations' continuing growth and development as the baton of leadership passed from the older to the younger generation. This past Saturday, October 26th, members of the Organization for the Defense of Lemkivshchyna (Orhanizatsiia Oborony Lemkivshchyny, OOL) elected Mark Howansky as the new President of their National Board, while on October 6th, members of the Lemko Research Foundation, Inc. (LRF) elected Andriy Khomyk as their new President. Calling the elections "historic," Mr. Khomyk said at the OOL convention banquet on the evening of October 26th that this handover of responsibilities would allow the next generation of leaders to build on the great work and knowledge of their predecessors, with whom they shared deep emotion for their ancestral land of Lemkivshchyna and Lemko issues. Mr. Howansky said in his acceptance speech that he would strive to sincerely listen to and incorporate the ideas of every member, old and new, stressing the need for all Lemkos to work together moving forward. Mr. Khomyk, born in Lviv, was raised by parents Maria Odrekhivska and Lemko Ukrainian poet Basil Khomyk, who came from the Lemko villages of Wilka and Myscowa, respectively, before their deportation to Soviet Ukraine in the 1940's. He attended the famous Lviv Children's Art School, where he later taught, and graduated from the Lviv College of Decorative and Applied Art, as well as the Institute of Applied and Decorative Arts. He was active in the Lviv association "Lemkivshchyna," developing and leading its youth chapter. His artwork, which brought back to life the forgotten technique of painting on glass, led him to the United States, where he eventually moved in the 1990's. Mr. Khomyk is a member of OOL's Yonkers, NY branch and creator of OOL's first website. He currently lives in Norwalk, CT with his wife Tatyana; his son Vasyl attends Richmond University and his daughter Olena attends the Massachusetts Institute of Art and Design. Mr. Khomyk replaces former LRF president, Steven Howansky (Mark Howansky's father), who passed away earlier this year, in February 2013. Born to parents who were relocated from the Lemko villages of Zdynia and Smerekowiec under the 1947 forced resettlement campaign "Operation Vistula," Mr. Howansky grew up in Yonkers, NY, where he was active in Ukrainian-American organizations from a young age, including St. Michael's Saturday School of Ukrainian Studies and the Ukrainian-American Youth Association (CYM). An avid sports supporter, he has held numerous positions ranging from player to club president with the Yonkers "Krylati" Sports Club, the New York "Kozaks" Hockey Club, the Ukrainian Sports Federation of U.S.A. and Canada (USCAK), and the International Ukrainian Football Tournament (IUFT). Mr. Howansky holds a bachelor's degree in engineering from Harvard University and a master's degree in business administration from New York University. A member of OOL's Irvington, NJ branch, he currently lives in Green Brook, NJ with his wife Maria Hrywna, who is also of Lemko descent, and their young daughter Nadya. Mark Howansky takes over the reins from former OOL President, Zenon Halkowycz, who led the organization for the past 14 years and now holds honored member status in recognition for all of his work. At the OOL convention banquet, Mr. Halkowycz thanked the members of the organization for their partnership over the years, as well as expressed appreciation to the SUMA (Yonkers) Federal Credit Union and the Selfreliance Ukrainian American Federal Credit Union in Jersey City, NJ for the monetary gifts they donated to OOL that evening to help its future work. OOL's origins reach back to September 1933, when a committee was formed to send books to the Lemko region (located in the Carpathian Mountains in current southeastern Poland) and strengthen education through traveling libraries. 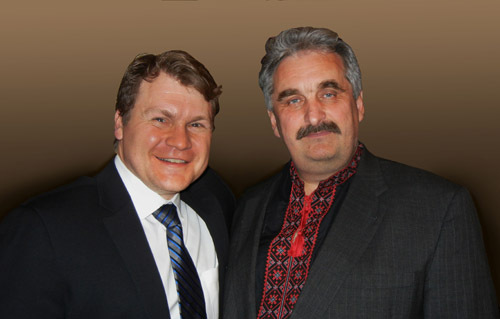 Among OOL's goals stated in its bylaws are to organize Lemko Ukrainians in their communities, foster their language and traditions, conduct cultural and educational work, and provide humanitarian support to natives of the Lemko region and their descendants, including donating financial assistance to schools, churches, artistic ensembles, and educational institutions. During OOL's growth in the late 1970's and early 1980's, the Lemko Research Foundation was founded under its auspices and incorporated as a non-profit research organization to conduct publishing activity. The Lemko Research Foundation promotes the study of the history, literature, art, and traditions of the Lemko region, with the official goal of preserving the identity and culture of Lemko Ukrainians by disseminating information to the public through written materials. For more information about both OOL and LRF, including details about the new leadership boards, information about upcoming meetings, and how to join as a member, see the website: www.lemko-ool.com.